A soft cookie dough RY4 recipe that's excellent in RDA's but sings in tight MTL tanks like a Kayfun. Also this recipe is meant to be tinkered with and added to. Check out the post for the full flavor notes as well as topping ideas. This is a kind of odd flavor profile which makes it right up my alley. I gave this a two weeks steep, busted it out and I wasn't happy. Just tasted like ground up raw walnuts to me. Another two weeks in the basement and it was amazing. Excellent tobacco base with cookie and nutty accents. This is definitely a good mix. Dark and complex. I really love this mix with JF RY4 Double subbed. The caramel element interestingly comes from the cookie dough and with a really dark and sweet brown sugar note. You can twist and add to this mix pretty easily to make it your own as well. Great job! Awesome RY4 mix, it's like biting into an RY4 cookie. 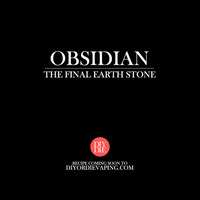 Obsidian is the perfect name for this recipe, everything in it is dark and full. No strong bright notes, just a blend that fills the void of my empty shell. This is a ADV for me when in the mood for cookie sweet complex vapes.. AWSOME job here.. I love this recipe. RY4s tend to overwhelm other flavors for me, though I do love them. Next time I'm going to mix this with 2% RY4 so that I can get more of the cookie dough flavor. I only mixed the original recipe so far, but I will definitely build on it next time. Great recipe. RY4 and cookie dough are the main notes and go together really well. Get a sort of maple syrup and ice cream type thing from it as well - especially in the aroma from the bottle. Found it a little heavy on sweetener for my tastes, and the flavour level was a little overwhelming with in an RDA. Currently steeping another batch with lower VG, halved sweetener and will vape it as MTL - I think this batch will hit the spot perfectly. Really fkn good! Great ADV for sure! This is something special, I stayed away from it due to the RY4 Double and not generally liking tobaccos in the past, this is my favourite vape flavour I've ever mixed. Wayne really did an amazing job with this one. I love this recipe mainly due to the versatility. You can add your own top notes and there is tons of leeway with the concentrate ceiling. Even by itself without tinkering this is a fantastic recipe and an easy ADV if you are into that kind of profile. I am looking forward to mixing this again come fall and winter. Much love! I finally received my FLV Cookie Dough, and other essential ingredients. All I can say is WOW. I still need to let it steep more, but I am loving it right away! Glad I made a big batch. Thank you Wayne for sharing this recipe and all you do for us in the DIY community. Much Love! Gonna have to sing some praise here. I have tried several enyawreklaw mixes and some I enjoy, and some I don't. Taste is different for everyone. This one...this is great. the awesome notes from ry4d come through and just accentuate the cookie dough so well. everything else brings this together and makes for a great mix. I'm thinking of playing with some raspberry and white chocolate. see how that goes. This is really fantastic. I've mixed it with black cherry pipe, apricot and black currant so far and all toppings have worked great. Looking forward to trying others. I really like this recipe!! I was playing around with FLV cookie dough before this was released and right away I kind of got an RY4 flavor from it. But with the additions wayne put in here it all blends so well together!! I personally like it with 5% tfa banana nut bread layered on top the best, as Wayne suggested. But this is a great recipe without it. Cookie Dough is a hard flavor to nail and I'm glad he once again worked his magic on this. Make sure to give it a week and it turns into a thick well balanced recipe! Anyone discouraged to try an RY4 recipe, don't be, I promise you will not be dissapointed!